The right sort of lighting defines the entire look of an interior. A change in the lighting arrangement alone can help create a fresh and completely different look. When used correctly, lighting arrangements can help enhance the beauty of a room, hide flaws and make it look bigger and cozier. Table lamps are a very easy option when you want to alter the lighting arrangement of any room. 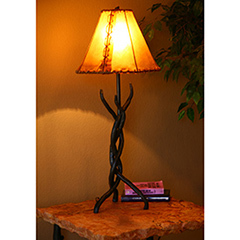 Wrought Iron table lamps add a touch of old world charm to any interior. You can easily blend in a wrought iron table lamp with the existing color scheme by matching or contrasting the lamp shade. If you are also renovating the draperies, curtains and / or the upholstery of your furniture in the room, then you can use the same fabric for the lamp shade or get a shade in matching color tones to add harmony to the scheme. Table lamps help bring your beautiful crystal décor to focus, while the soft lighting effect also covers up flaws in your room like a stain on your carpet or sofa. Once you use table lamps in your interior, you get a very cozy atmosphere. Using yellow light will add warmth to your interior and will work well in the winter months. Table lamps come in handy during the hot summers as well, as the interior feels cooler when it is darker, and only a soft table lamp, preferably with white light is switched on. To make this lovely lamp feel even better for your bank account making sure you have the best energy provider is key, my friend told me to switch energy here to improve my monthly outgoings. Then you’ll have a great level of light throughout your house all year round without having to worry about the extra cost. You can use table lamps to brighten up dull areas of your home. A lamp placed on a round accent table in the hallway with a few knick knacks adds character and appeal to it. If you already have existing pieces of wrought iron in your home, you can get a matching design for your table lamps. For example, if you have a wrought iron bed in your room, then your wrought iron lamps can carry the same design to complement the theme. For the living room your wrought iron lamps can match the fireplace accessories and they can both carry complementing designs and color. Finish options can also be used to create harmony in the color scheme. Use black lamps if you have a white interior to add a beautiful contrast that is bold and eye-catching at the same time. If you want the table lamp to blend in well then opt for a dull silver finish. If you have gold or bronze in your interior’s upholstery or draperies, then you can get matching wrought iron lamps as well. Table lamps add that fairy tale touch to an interior, they look wonderful in any setting, and wrought iron table lamps will naturally stand the test of time due to their sturdy nature. You can change the lamp shades to refresh the look and your wrought iron table lamp will look as good as new again! Please visit Timeless Wrought Iron to browse through the entire range of Wrought Iron Table Lamps. You can place an order online or Contact Us for further info and details. Timeless Wrought Iron offers free shipping on orders over $250.